Combine all ingredients in a stand mixer and beat until combined. Fill cupcake liners ½ – ¾ full. Reduce heat to 350 F.
Bake for 18-22 minutes until toothpick comes clean. Remove from oven and move cupcakes to cooling racks to finish cooling. 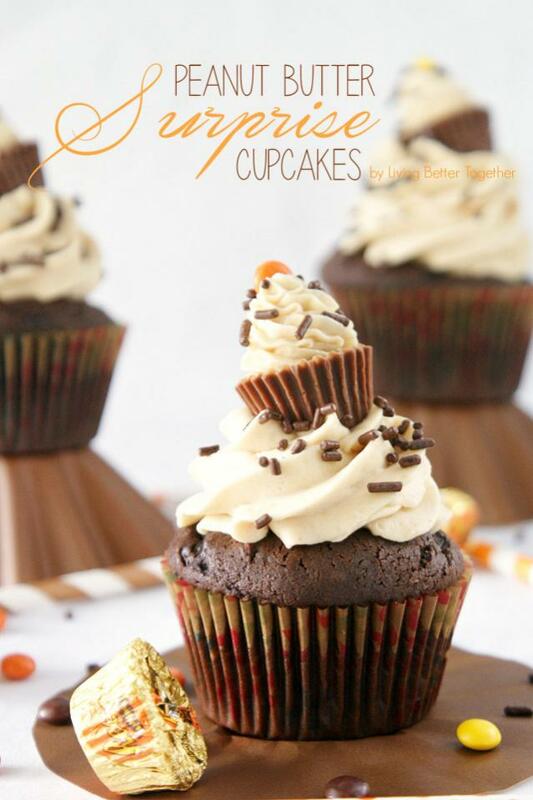 Use a cupcake corer to core the cupcakes, fill the holes with mini Reese’s Pieces. Cream Butter using a paddle attachment. Add vanilla and peanut butter and beat until well mixed. Add confectioners’ sugar a cup at a time, alternating with heavy cream. Whip on medium high speed for 2-3 minutes until frosting is light and fluffy. Top each cupcake with a Reese’s cup. For added wow, Use a small frosting tip to frost the Reese’s cup!